Debtors prisons were supposedly banned in the United States under federal law in 1853 and in 1983, the US Supreme Court rule unanimously ruled that only “willful” non-payers (those with the means to pay who refuse to) could be incarcerated for nonpayment. The recent report from the Department of Justice on the city of Ferguson, Missouri revealed a pattern of abusive use of municipal fines that put a heavy burden on the poor and black population of the city. It resulted in the resignation of municipal court Judge Ronald Brockmeyer and the transfer of all the city’s cases to the St. Louis County circuit court. It also put the spotlight on the modern version of debtor’s prisons run by states and cities around the country. Fees from traffic tickets and other minor offenses are often a major source of revenue for many communities. But what happens when you can’t afford to pay even a small penalty? Check out the clip above to learn more and to see the stirring ad Oliver’s team created to push the effort to #ShutDownTheFuckBarrel. If you have money, committing a municipal violation may pose you a minor inconvenience. If you don’t, it can ruin your life. The pitch is simple: For no cost, a private company will help collect fines and fees owed to cities. These for-profit firms, called probation services companies, don’t charge cities anything. Instead, these companies put citizens who can’t afford to pay fines, such as traffic tickets, on payment plans that slam them with exorbitant fees, and then illegally threaten people with jail time if they fail to make payments, according to a federal lawsuit filed Thursday by the Southern Poverty Law Center. Municipal use of private companies to collect the fines appears to be on the rise due to many cities’ increasing strapped finances. Smaller budgets can mean that when cities look to raise funds, they don’t have the resources to collect those fines themselves. Overall, however, strong historical data about the use of these practices does not exist because these private probation companies largely deal with city or county courts and are generally not transparent with their business practices. Not only does this system destroy the lives of people who are struggling to just survive, it also costs tax payers thousands of dollars to incarcerate them. So what is the purpose of these contracts, other than line the pockets of private debt collection agencies and private prison company executives. So yes, let’s #ShutDownTheF**kBarrel. The 2016 election is still 19 mind-numbing, soul-killing months away. There is, however, another important election in just six weeks, as Britain goes to the polls. And many of the same issues are on the table. Unfortunately, economic discourse in Britain is dominated by a misleading fixation on budget deficits. Worse, this bogus narrative has infected supposedly objective reporting; media organizations routinely present as fact propositions that are contentious if not just plain wrong. Needless to say, Britain isn’t the only place where things like this happen. A few years ago, at the height of our own deficit fetishism, the American news media showed some of the same vices. Allegedly factual articles would declare that debt fears were driving up interest rates with zero evidence to support such claims. Reporters would drop all pretense of neutrality and cheer on proposals for entitlement cuts. In the United States, however, we seem to have gotten past that. Britain hasn’t. The National Security Agency want to be able to hack more people, vacuum up even more of your internet records and have the keys to tech companies’ encryption – and, after 18 months of embarrassing inaction from Congress on surveillance reform, the NSA is now lobbying it for more powers, not less. NSA director Mike Rogers testified in front of a Senate committee this week, lamenting that the poor ol’ NSA just doesn’t have the “cyber-offensive” capabilities (read: the ability to hack people) it needs to adequately defend the US. How cyber-attacking countries will help cyber-defense is anybody’s guess, but the idea that the NSA is somehow hamstrung is absurd. Rep. Chris Van Hollen, the ranking Democrat on the House Budget Committee, is running for the Senate seat currently occupied by Maryland Sen. Barbara Mikulski. He is also running from his record – as a supporter of the “Simpson-Bowles” plan to cut Social Security and top tax rates, a once-favored economic agenda among Washington insiders and some wealthy private interests. That’s a smart move – but Rep. Van Hollen has more ground to cover. Social Security is clearly a major issue in the Maryland race. What are the national implications? Richard Brodsky: Rahm Emanuel Is Andrew Cuomo: Hillary Are You Listening? Rahm Emanuel is in trouble. His re-election as Mayor of Chicago is no longer a lock. His challenger has come out of nowhere, parlayed unease with his right-wingish economic policies, and a big controversy, to gain real traction in the April 7 run-off. Her name is Zephyr Teachout. It turns out that voters, especially Democrats, want no part of that calculated positioning, no part of austerity economics, Tea Party cuts in government spending, and tax policies that favor the 1%. That may be sound policy, or not. But it’s a lesson that any politician needs to understand. Are you listening, Hillary? Ferguson will hold municipal elections April 7. The mayor and five of the six city councilpersons are white. Three are up for reelection. Since Michael Brown was gunned down by former Ferguson police officer Darren Wilson on August 9, the one loud refrain has repeatedly been how could a city where African-Americans make up the overwhelming majority of the population be policed by a nearly all-white police force, and governed by a nearly all-white city administration? The thought was that the Brown slaying angered and engaged so many thousands that it was almost a done deal that the first chance black residents got they’d jam the polls and totally revamp city government in Ferguson. The revamp meant the election of a majority black city council and mayor. This in turn could quickly mean the hiring of a black city manager and other top level administrators. This in turn could mean an overhaul of the police department to make diversity and reform a reality. Eight months after the Brown slaying, the April elections will put that thinking to the test. I have a triple play of Climate Change articles for you this morning! WHO’S THAT PERSON BEHIND THE LAB COAT? When you hear “climate science” what do you picture? Charts, graphs, melting icebergs, or rising sea levels? Most of us forget there are people behind all the climate data going into today’s news headlines. Regular people are working hard, every day, studying climate change and exploring solutions in order to improve the future we’re leaving our children. For these scientists, it’s not about the numbers in studies and charts. It’s about what these numbers mean for the planet and the people who live there. Which is why we think it’s long past time to humanize climate science. So let’s get to know the faces behind the facts. 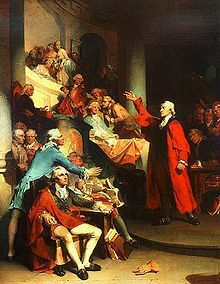 During a speech before the second Virginia Convention, Patrick Henry responds to the increasingly oppressive British rule over the American colonies by declaring, “I know not what course others may take, but as for me, give me liberty or give me death!” Following the signing of the American Declaration of Independence on July 4, 1776, Patrick Henry was appointed governor of Virginia by the Continental Congress. Patrick Henry (May 29, 1736 – June 6, 1799) was an orator and politician who led the movement for independence in Virginia in the 1770s. A Founding Father, he served as the first and sixth post-colonial Governor of Virginia from 1776 to 1779 and subsequently, from 1784 to 1786. Henry led the opposition to the Stamp Act of 1765 and is well remembered for his “Give me Liberty, or give me Death!” speech. Along with Samuel Adams and Thomas Paine, he is remembered as one of the most influential exponents of Republicanism, promoters of the American Revolution and Independence, especially in his denunciations of corruption in government officials and his defense of historic rights. After the Revolution, Henry was a leader of the anti-federalists in Virginia who opposed the United States Constitution, fearing that it endangered the rights of the States, as well as the freedoms of individuals. Responding to pleas from Massachusetts that the colonies create committees of correspondence to coordinate their reaction to the British, Henry took the lead in Virginia. In March 1773, along with Thomas Jefferson and Richard Henry Lee, Henry led the Virginia House of Burgesses to adopt resolutions providing for a standing committee of correspondents. Each colony set up such committees, and they led to the formation of the First Continental Congress in 1774, to which Henry was elected. The crowd, by Wirt’s account, jumped up and shouted “To Arms! To Arms!”. For 160 years Wirt’s account was taken at face value, but in the 1970s historians began to question the authenticity of Wirt’s reconstruction. Historians today observe that Henry was known to have used fear of Indian and slave revolts in promoting military action against the British, and that according to the only written first-hand account of the speech, Henry used some graphic name-calling that failed to appear in Wirt’s heroic rendition. In August 1775, Henry became colonel of the 1st Virginia Regiment. At the outset of the Revolutionary War, Henry led militia against Royal Governor Lord Dunmore in defense of some disputed gunpowder, an event known as the Gunpowder Incident. During the war he served as the first post-colonial Governor of Virginia and presided over several expeditions against the Cherokee Indians, who were allied with the British. Henry lived during part of the War at his 10,000-acre Leatherwood Plantation in Henry County, Virginia, where he, his first cousin Ann Winston Carr and her husband Col. George Waller had settled. During the five years Henry lived at Leatherwood, from 1779 to 1784, he owned 75 slaves, and grew tobacco. During this time, he kept in close touch with his friend the explorer Joseph Martin, whom Henry had appointed agent to the Cherokee nation, and with whom Henry sometimes invested in real estate, and for whom the county seat of Henry County was later named. In early November 1775 Henry and James Madison were elected founding trustees of Hampden-Sydney College, which opened for classes on November 10. He remained a trustee until his death in 1799. Henry was instrumental in achieving passage of the College’s Charter of 1783, an action delayed because of the war. He is probably the author of the Oath of Loyalty to the new Republic included in that charter. Seven of his sons attended the new college.